Permanently attaches to the bottom of the control modules or to another expansion module. Same bench footprint as the control module by itself (9x12"). Adds 128 test points per expansion module. Perfect in applications where you do not require the additional board fixtures. May be cascaded up to 1024 (M2U, M3UH, M4) and 2560 (M3U) test points. An overview. Click to read. 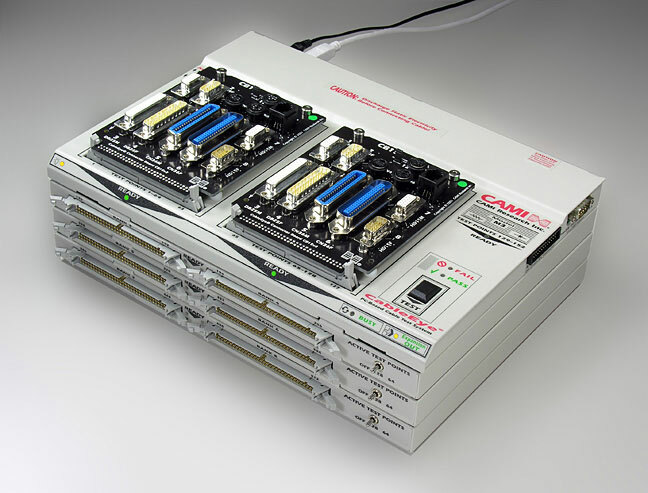 Control the number of active test points on each module to optimize measurement speed, or turn off all modules and use the control module in the usual manner with our standard CB connector boards for two-ended cables.The number of active test points is set within the software for the M4 system. For all others models, it is set with switches. 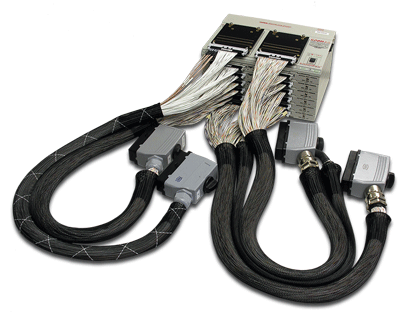 The configuration shown here provides 512 test points for testing large cables, backplanes, or wiring harnesses. Add up to 15 expansion modules to provide a total of 2048 test points. Available for Model M2U (Item 811U base, Item 813 expansion), M3U (Item 821U base, Item 823 expansion), or M3UH (Item821UH base, Item 823H expansion). Find your optimal tester with our tester selection Wizard. Our HiPot Testers Expand Too!